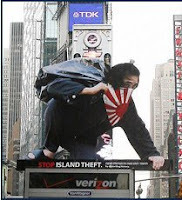 Today's English edition of the Chosun Ilbo carried this image of a life-size figure of a thief,wearing a Japanese flag as a mask. The sign reads "Stop island theft. Japan attempts to steal Asia's islands by distorting history." It is part of a guerrilla advertising campaign by Yi Je-seok. I think it also illustrates the powerful use of an image.